Fire Chief Marc Bashoor continued his commitment to be involved with members of the community. On Saturday, September 17, 2011, he attended the Oakcrest Community Preparedness event, an open house for a new venture at the National Harbor and the annual Port Town Days at the waterfront park in Bladensburg. Lt Governor Anthony Brown and other local officials celebrating the annual Port Town Day joined Chief Bashoor. Thousands of area residents braved cool temperatures and occasional light rain. Volunteers from Bladensburg Fire/EMS Station 809 distributed fire safety information and provided EMS support to the event. Prince George's County Fire Chief Marc Bashoor, Lt Colonel Ben Barksdale and Public Information Officer Mark Brady attended an open house Saturday at Fire Rescue TV, which has established headquarters at the National Harbor. 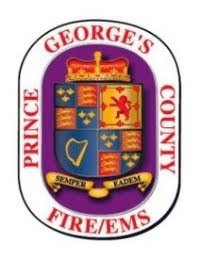 Fire Chief Bashoor stated, "We have entered into very preliminary dialogue about the uses and potential benefits of Fire/Rescue TV for the Prince George's County Fire/EMS Department." The National Harbor site, Studio B, is an impressive full production broadcasting studio and is well worth a visit. For additional information on Fire Rescue TV, visit their website at www.firerescuetv.com. Many thanks to Martin C. Grube and Robert Wolgamotti for the first class tour of the facility and explanation of the services. Pictured below is Robert Wolgamotti with his "fire dog" with one of the prop recording sets under construction in the background. 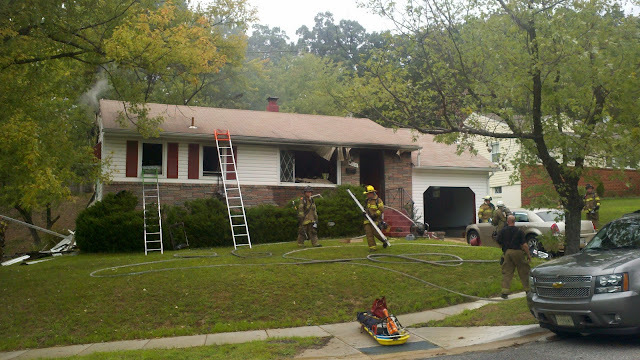 Prince George's County Firefighters made quick work of a Lanham house fire Saturday morning. Just before 10:00 am firefighters from West Lanham Hills and surrounding stations responded to a reported house fire at 7200 Patterson Street. Fire/EMS units arrived on the scene to find fire showing from the rear of the house. Firefighters searched the home and determined that everyone had escaped safely. It required about 15 minutes to extinguish the fire that involved a rear deck and kitchen on the first floor with extension into the roof area. There were at least two adult occupants inside when the fire started and they escaped without injury. Five occupants normally reside at the house and will be displaced. The County Citizen Services Unit is on the scene assisting them. No civilian or firefighter injuries have been reported. The cause of the fire is under investigation and fire loss estimates are still being tabulated. Fire/EMS units arrived with fire showing from the rear of the house.